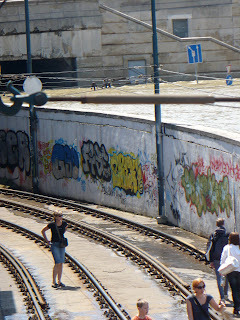 "This Girl is Hungary": Budapest was Sinking and I Don’t Think Anyone Should Have Even Considered Swimming. Budapest was Sinking and I Don’t Think Anyone Should Have Even Considered Swimming. 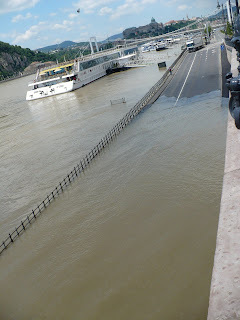 Holy taledo the Danube flooded a couple weeks ago and it was like nothing I have ever seen. One day you are spitting off a bridge and wondering if it had hit the water and the next thing you know your tram line is full of water and the parliamentaerians are going to work in traditional boats. Lies! I know, but they should have because one. that would have been awesome and two. they could have seeing as the stairs conveniently led directly into the water. I surveyed the situation on a daily basis, draggin' (because in 'Merica they don't use "G"s) my American tourist friend along, leading him to believe that a dirty river was all this city has to offer. -One of the many bridges in which tour boats couldn't fit under... Not the one I was spitting off of unfortunately. -People! Don't walk in there! Don't you see the water busting through the cracks. DON'T YOU SEE?!?! -I watched two boys bike into the water and secretly hoped they would get duck itch. Not Pictured: The road under water on the other side of the river. -I get it... there aren't many beaches to offer your kids. But, seriously parents, this was no place for a child.